Gardai have recovered six oil paintings which were stolen from a church in Kiltullagh in 2013. The specially commissioned paintings by Dublin-born artist Evie Hone were part of a set of 14 Stations of the Cross estimated to be worth about €500,000. Following the robbery at St Peter and Paul's Church, Crimestoppers offered a reward for any information leading to the recovery of the stolen artwork. The pieces are extremely prestigious and had been commissioned by a local benefactor in 1945. Evie Hone's famous work is on display at numerous locations around Ireland and her best known pieces are the East Window at the Chapel at Eton College in Windsor, and My Four Green Fields, which is now at Government Buildings. Gardaí in Tullamore recovered the paintings on waste ground in Edenderry yesterday (Wednesday ) as part of a planned operation. The pieces were found in good condition and were removed to Tullamore Garda Station for forensic and technical examinations. 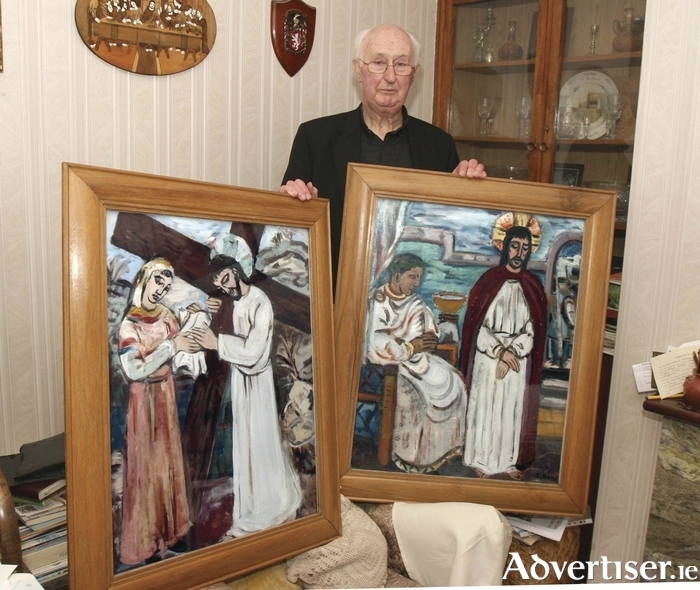 Speaking to the Galway Advertiser after returning from Tullamore with the paintings, parish priest Fr Martin McNamara said he was delighted to get them back. "I am on top of the world today. It means so much to get the paintings back after three years. It is great for the parish as well. It was a terrible shock at the time of the robbery that anybody would do such a thing." The priest had got the stolen paintings re-produced in the interim, but says he now hopes to return the originals to their rightful place. "We have to get frames for them, as the frames are gone, but they are in great condition so hopefully they will go back up on the wall. It was such a horrible thing to happen, and I was doubtful really we would get them back, but I suppose I always had a little bit of hope at the same time. It is a great day for us, thank God they have been found. There has been huge interest in it since word got out they were found. I suppose everybody likes a happy ending." No one has been arrested in connection with the theft and enquiries are ongoing. Anyone with information is asked to contact Tullamore Garda Station on 057-9327600, Galway Garda Station on 091-538000 or the Garda Confidential Line 1800 666 111.